If there is one health imbalance which is common to many medical conditions, it is Chronic acidosis. So pervasive is this under-the-radar health problem, yet many have never even heard of it, though they suffer its consequences for years or even decades. Simply put, Chronic acidosis is a systemic condition of the body which slowly emerges over time due to improper eating, especially when there is a sustained level of stress in one’s life that is not managed in a healthy way. There are other co-factors, but a substandard and incompatible diet is by far the primary physical cause when coupled with habitual maladaptive stress responses to the pressures of life. All foods and beverages can be divided into three categories: those that are acidifying; those which are alkalizing and those which have a neutral effect on the body’s PH. Please click on the chart to enlarge. If your regular diet is high in the following acidifying foods, then there will be a much greater tendency for the body to move into a chronic condition known as acidosis. Each of these foods will contribute to an acidic state because of how they are digested and metabolized in vivo (in the body during digestion). • White bread, white rice, pasta, biscuits, bagels, doughnuts, pastries and crackers. There are other foods which are acidifying but this is a good start for those who need to be on the lookout. Again, this list of foods which assists in alkalizing the body is by no means exhaustive, but it does provide a great start for anyone looking to make the shift in body PH. 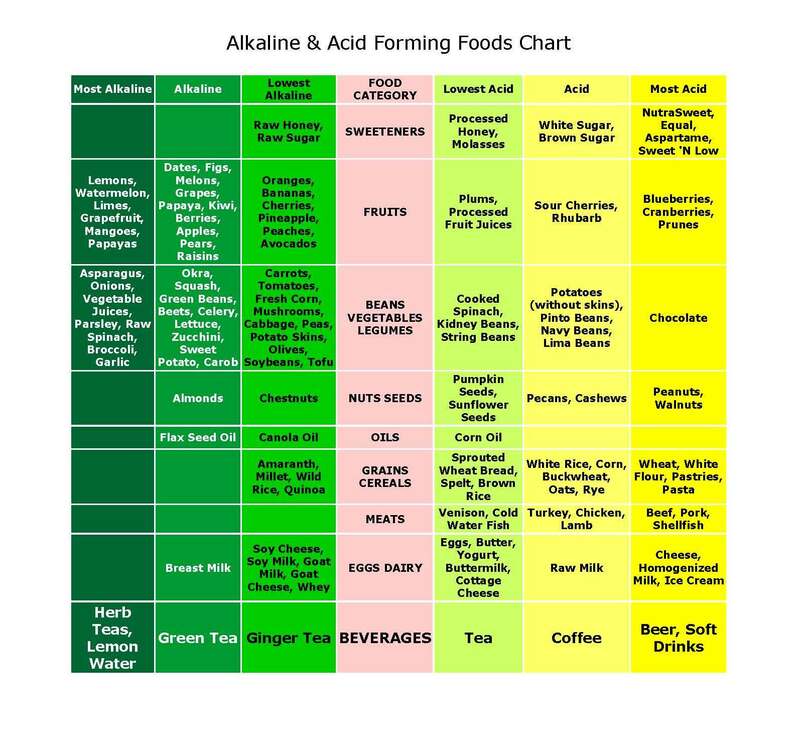 *Please be aware that there are numerous Acid/Alkaline Lists published on the internet. They are by and large the same, although some do differ with respect to various individual foods. We have compiled both of these lists from the Livestrong.com website and have found it to be consistent with our understanding. You can’t go wrong with a lot of fresh veggies and fruits. It is quite noteworthy that there are some subtleties involved with this type of acid-base body chemistry which many health commentators either ignore or are unaware of. For instance there is the scientific fact that lemons are very alkalizing although they would seem to be highly acidic. When ingested on a regular basis, freshly squeezed lemon juice mixed in a cup of water will serve to alkalize the body with unusual potency. A quarter of a lemon a day squeezed in 8 to 12 ounces of water is also quite effective in detoxifying the liver. There are other counter-intuitive aspects to this topic which will be taken up in a future session. For now the goal for many is to gradually move their food and beverage intake toward an 80/20 mix (that’s an alkaline/acid ratio). It will be the first time that many have achieved this proportion in their entire lifetime; therefore, it’s preferable to maintain this new diet regimen for as long as possible. Anyone suffering from chronic acidosis will hopefully incorporate some of the many alkaline foods into their normal eating pattern once they go back to their previous dietary habits. What are some other risk factors associated with Chronic acidosis (CA)? (10) This list is by no means comprehensive, so everyone is encouraged to assess their home, work and automobile environments with care. There are many other cofactors which cause the body chemistry to acidify such as the predominant emotional and mental states. For instance, an individual in the state of constant high anxiety will create the internal conditions for an acidic condition to take hold. Likewise, one who goes from home rage to road rage, and gets angry at the drop of a hat will experience even the most alkaline food turning into acid in their stomach. This is one very good reason never to eat when you’re in a fit of anger. It’s always better to let the strong emotions pass, for your body’s sake. The truth be told, Chronic acidosis is a precursor to countless diseases and ailments. Not only that, but many other diseases and illness will directly contribute to Chronic acidosis if not addressed in an effective and steadfast manner. This symbiotic or mutually reinforcing relationship is similar to a feedback loop whereby both the CA and the cancer mutually reinforce each other causing a downward spiral, much like we see in a Stage IV cancer or an AIDS patient. It is well known that every cancer patient must efficiently process the acidic effects of the cancer itself, as well as all the acidifying chemotherapy, radiation treatments, lack of exercise, emotional depression, malaise and lethargy associated with being bed-ridden, etc. These obstacles can all be overcome by one who is aware of how to meet each challenge head on. For example, John Gunther in his book DEATH BE NOT PROUD outlines a potent dietary regimen that anyone can engage with a little support. John’s primary dietary regimen consisted of drinking copious amounts of freshly squeezed vegetable juices. The Gerson Institute which specializes in cancer therapies has established an excellent set of protocols that includes regular coffee enemas which can be particularly effective. 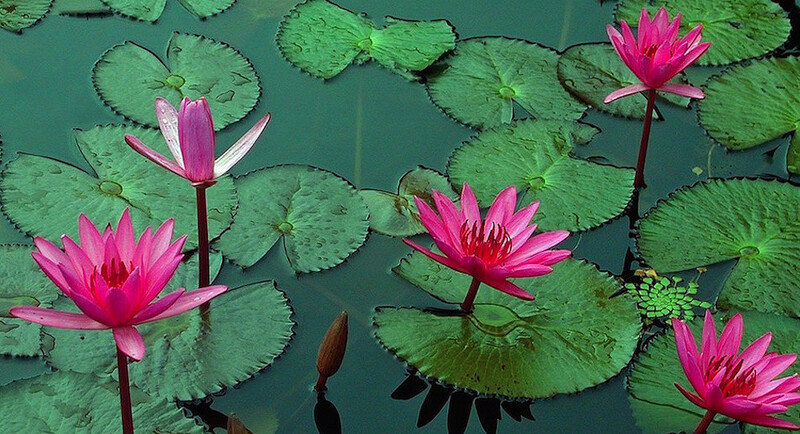 There are also various schools of yoga that teach meditation, hatha yoga, pranayama, chanting, and contemplation techniques which address the mental and emotional components of cancer as well as other serious diseases like AIDS. The viral and fungal components of cancer love sugar and white wheat and other food ingredients which create the highly acidic environment in which it thrives. 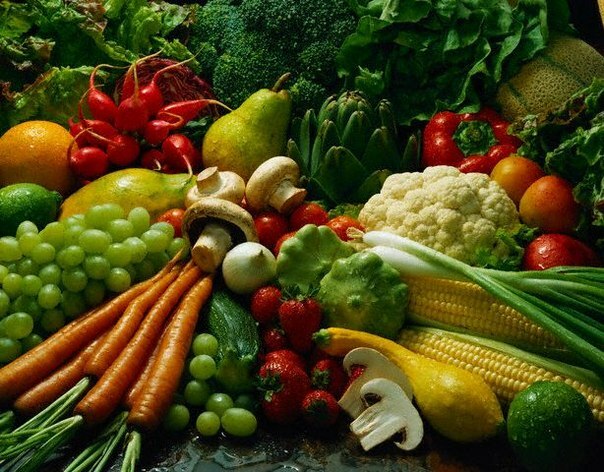 Deprive the cancer cells of this necessary food and you can starve them into extinction. It really is often that simple. Of course, when one combines the most appropriate diet with all the other recommended lifestyle changes, you do put the odds in your favor in such a way that will greatly increase the likelihood of remission with no future recurrence. Especially when a wholesome lifestyle or wellness program is adhered to for the rest of the lifetime, cancer and every other disease will unlikely find a home in your body. The recommended alkaline diet can be a difficult regimen for some to adhere to, especially given their type of work, workplace constraints or work demands. Certainly they are encouraged to gradually move away from such a strict set of prohibitions particularly when it causes additional stress. However, the more one sticks with a balanced, alkalizing diet, the better they will feel and thrive. There is a flip side to this story which ought to be acknowledged. 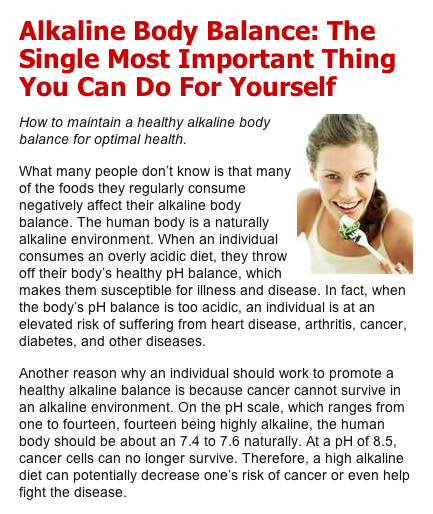 The body can also be too alkaline which can actually cause a medical condition known as alkalosis. Most never have to worry about such a predicament; however, we are compelled to issue the follow caveat regarding water ionizers and alkalizers. The following article takes up this health issue for those who are unaware, yet vulnerable to the numerous sales pitches coming from the MLM industry. Water Alkalizers & Ionizers: Is It Healthy To Drink Only Alkaline Water? Given the preponderance of acidic food in the “all-American” diet, almost everyone can benefit by including more alkaline food in their daily meals. Fresh vegetables and fruits, whole grains and legumes, raw seeds and nuts, herbs and spices are often ignored in favor of pre-cooked and processed foods, meat-filled dishes and week-old sweets full of inferior ingredients. All of the manufactured soft drinks, synthetic juices, coffees, cappuccinos, and teas only add fuel to this fire known as Chronic acidosis. In light of the direction that society is going with respect to food preparation and delivery, it can often require a very creative approach to counterbalance the trend toward an acidic condition. In this regard, planning your meals well in advance with well-rounded menus that have been pieced together over months of creating them is a sure way to control what you eat. Conversely, choosing your foods on the fly will almost always land you in a place you may not want to be. Most foods available on demand are quite often of the most acidifying type and what you really want to avoid, especially when dealing with a chronic illness, lifelong condition or intractable disease. Therefore, our best recommendation is to “plan, Plan and PLAN” your meals in advance, whenever possible. You’ll always be very glad that you did! Perhaps the best way to ensure that your meals are properly planned out is to do so when you prepare the grocery list. In this way you can create nutritious, balanced, alkaline-rich menus for each meal of each day for which food is being purchased. There are many excellent cookbooks (e.g. Ayurveda cookbook), nutritional reference books, and health/wellness websites which can also be consulted at this time. Making a hard copy of a high-integrity Alkaline/Acid Food List for the kitchen would also be a very good idea. All content found at The Health Coach is for information purposes only. Therefore, the information on this website is not a substitute for professional medical care and should not be construed as either medical diagnosis or treatment. All information contained herein ought to be considered within the context of an individual’s overall health status and prescribed treatment plan. Since The Health Coach does not diagnose, treat, mitigate, cure, or heal any type of disease or medical condition, the information contained at this website is not intended to provide specific physical, mental, emotional or psychological health advice. It is entirely the reader’s decision to act or not act on any information at The Health Coach. Therefore, we fully invoke the HOLD HARMLESS clause for those who are responsible for putting any of this information into practical use and application. This entry was posted in Uncategorized on July 11, 2012 by The Health Coach.